Will This Interactive Device Finally Kill The Mouse? Despite a slate of new products that promise a new generation of human-computer interaction, no company has yet been able to resolutely slay the decades-old desktop mouse. Now a company called Ractiv thinks their new device, dubbed Haptix–which turns any surface into a 3-D multi-touch one–can eliminate the standard desktop’s tappy-navigation tool for good. Earlier forays into this area have gotten mixed reviews. When Leap Motion, the most hyped of these next-generation interaction products, launched their motion gesture controller in July, the reviews were nearly unanimous: It’s a lot of work for developers to integrate into their apps, and equally demanding for users, their arms hovering outstretched above their keyboards, to control. 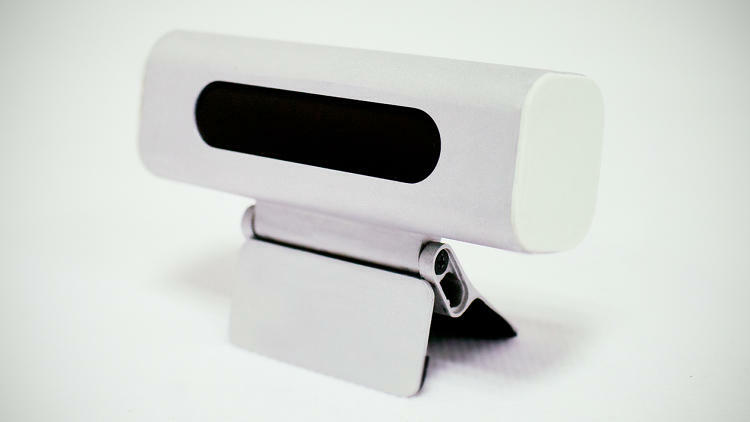 The MYO armband, another alternative controller, solves the software problem by integrating itself at the operating system layer, but demands similar physical engagement. Haptix, by most measures, is simpler to operate and cheaper to build. Our team spoke to Haptix creators Darren Lim and Lai Xue about how the device works. In terms of hardware, two CMOS image sensors–as you might find in a webcam–provide 3-D sensing that can capture the position of the user’s hands in 640×360 resolution, allowing for tactile feedback. Haptix adds pinch-to-zoom, swiping, and scrolling–all intuitive touchscreen motions–to a standard laptop or desktop keyboard. Haptix also automatically deactivates when you type. The device also turns a kitchen table into a multisensory surface. Lim uses it when cooking to keep his grubby fingers off the keyboard. Lim says he’s seen Haptix compared to the Leap sensor continuously since its August launch on Kickstarter, where the project reached its target goal of $100,000 in five days. But it’s a game of apples and oranges. Leap’s gesture-based technology might let you play God by pulling the trigger on a hypothetical pistol, but the impersonation of body movements isn’t intuitive for users, says Lim. “A lot of technology out there is supposed to be ‘a mouse killer’ but they all feature a new form of interaction that we’re not familiar with, like swiping in the air,” says Lim. The physical toll of motion gesture technology is a stumbling block for gesture-controlled devices, but Haptix’s intuitive gestures alone won’t kill the mouse. In creating mouse-slaying technology, accurate navigation and control is a necessity– something that Lim considered during development. The ability to keep your hands solely on the keyboard was a huge plus for an accountant using Excel who likened Haptix to the sensation of using the ThinkPad during Lim’s testing–but even more convenient. Lim’s also keen to point out that the mechanism, and therefore marketable scope, of Leap and Haptix are vastly different. “Leap is more about enabling a new form of interaction with custom apps, like an Airspace business model, while Haptix is about interacting with today’s user interfaces,” he says. Innovative technology is redundant if it taxes someone’s choice to invest. Haptix’s nifty N10,500 price tag positions it well among its competitors–Ubi Interactive, a device used to make walls multitouch, costs upwards of N55,500. There’s still work to be done. Haptix is plug in and play–through a USB 2.0 cable–as wireless technology made the device too bulky. Haptix is also not currently available for Android or OSX, although Lim’s addressing both issues in the near future as well as improving the device’s field of view from 120 to 150 degrees. He also thinks the integration of Haptix’s multitouch technology into keyboards is an option if interest grows. But the evolution to a mouse-less office desk isn’t something Lim sees happening immediately. Are We Truly Ready to Develop and Unite Nigeria?